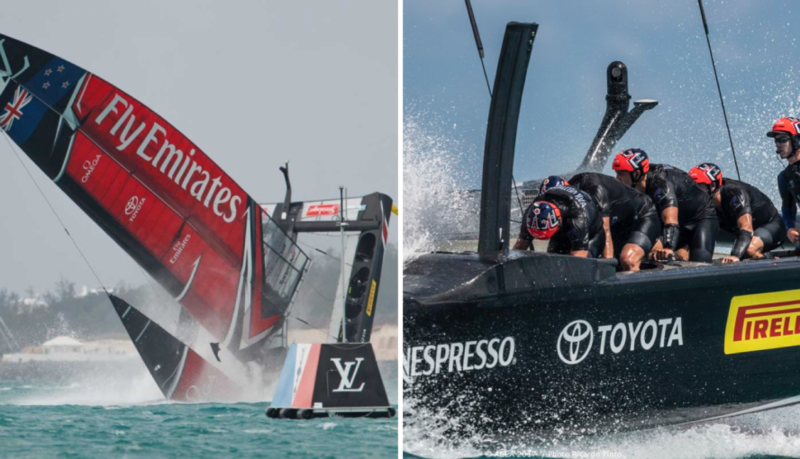 Two images have captured the drama of this year’s America’s Cup: the sight of Team New Zealand’s boat catapulting forward, nose-first in the middle of a race; and the Team New Zealand crew hunched over bikes in the boat hulls, looking like they should be in a velodrome rather than on the sea. Both these images point to major technical and performance breakthroughs in boat design. Each of the six racing teams invest around £10m on boat design. Many aspects of the 50ft multihull boats are prescribed, including the design of the hulls, the cross members that connect them and the shape and size of the wing. Each team is working within very tight margins to find that edge that leads to competitive advantage. Team New Zealand won the final against the US Team 7-1 and achieved speeds of up to 4 times the speed of the wind. So, how did they find their edge? What was the secret to their performance breakthrough? The technical advantages have been widely reported and are relatively obvious to even the casual observer. While 5 of the 6 teams opted for traditional hand-cranked hydraulic systems, known as ‘grinding stations’, Team New Zealand opted for pedal power. Legs are more powerful than arms, and so the New Zealand boat had more hydraulic power to operate the wings and foils on the boat. The source of the breakthroughs for New Zealand was in how they were thinking. Just two years before their emphatic victory, the New Zealand team were on the brink of pulling out of the America’s Cup for lack of funds. They were 18 months behind their competitors in boat development. Firstly, Team New Zealand diversified their expertise within the design team. They recruited experts in specialist fields such as hydraulics, system programming and aerodynamics. They weren’t interested in yachting experience. Bringing in new talent with a different way of thinking helped promote an open-minded approach, with technical solutions outside of the usual way of working considered and embraced. This diversity of thinking resulted in a number of innovations, not least putting bikes on board to harness pedal power in place of the arm-powered grinders used by all other 5 teams. Secondly, they created a central, joined-up idea that connected the diverse perspectives within the design team. They decided that they would focus entirely on speed over stability. To override the trade-off between a foil that is stable and one that is fast. As Dan Bernasconi, New Zealand’s technical director explained, “We decided right at the beginning that we’d aim for really high-performance, but difficult to sail, and then work out how to sail it”. It was this shared focus and mindset around speed over stability that resulted in the spectacular and potentially disastrous capsizing (seen top left). But this mindset was also what enabled the New Zealand boat to out-pace all the other teams so incredibly. Expanding our thinking by actively driving for diversity. Breaking out from narrow reference points and linear thinking. The usual reference points are familiar and in our comfort zone. But if the perspectives we are drawing from are the same as everyone else in our sector/industry/race, how do we expect to make a breakthrough? Joining the dots across diverse perspectives, to counter disconnected and silo thinking. This often involves holding different and even contradictory viewpoints together. Identifying what connects diverse ideas and insights. We make breakthroughs when we make new connections.